Glassboro residents and visitors should be aware that the annual Cruise Night will be held on Friday, August 31 starting at 5:00pm and continuing until 9:00pm in the downtown area. 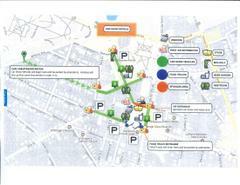 Please see the attached map and note that the green areas, especially the ones labeled "1" (N. Main St.) and "2" (W. High St.), will not be accessible by vehicles. Road closures will begin around 12:00 noon.